Yesterday, we posted the Bunny’s Golden Egg Giveaway presented by Mattel and Fisher-Price. It looks like it’s not the only promotion Fisher-Price is running at the moment. 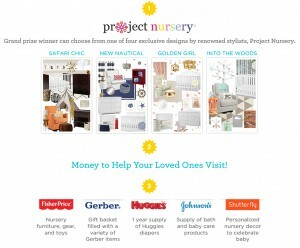 Last week, they also partnered up with Project Nursery, the ultimate children’s design resource, Shutterfly, a leader in digital personalized photo products and services, and Johnson’s to launch the Fisher-Price 2015 Best Possible Start Registry Sweepstakes! 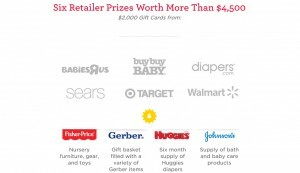 Sign up for the sweepstakes at fisher-price.com/registrysweeps then add Fisher-Price products to your registries at Babies ‘R’ Us, buybuyBaby, Diapers.com, Sears, Target, or Walmart and be entered for a chance to win your dream nursery! Plus, exciting retailer-specific prizes! It’s simple, lots of chances to win so let’s get started today! There is a limit of nine (9) entries for each Participating Retailer drawing and a maximum total of fifty-four (54) entries into the Dream Nursery drawing during the entire sweepstakes period, regardless of the method of entry. You could win a $25,000 Dream Nursery Prize Package featuring an exclusive designs by renowned stylists, Project Nursery and including $3,500 in cash to help cover travel expenses for family, nursery furniture, gear, and toys from Fisher-Price, a Gerber Baby gift basket filled with $250 worth of products, Johnson & Johnson bath and baby care products for one year, and a one-year supply of Huggies diapers. Six other winners will receive a Retailer Prize Package valued at over $4,500 including a $2,000 gift card, nursery furniture, gear, and toys from Fisher-Price, a $250 Gerber gift basket, a one-year supply of Johnson & Johnson bath and baby care products and a six-month supply of Huggies diapers. You may enter the Fisher-Price 2015 Best Possible Start Registry Sweepstakes during the period commending at 12:00:00 p.m. ET on Monday, February 02, 2015 and ending at 11:59:59 p.m. ET on Sunday, April 5, 2015. This Sweepstakes is open only to legal residents of the United States and the District of Columbia (excluding its territories, military installations, and commonwealths), who are the legal age of majority in the state in which they reside (age 18 or older; 19 or older in Alabama and Nebraska) at the time of entry.